In a large frying pan, melt 1 tablespoon of the butter with 1 tablespoon of the oil over moderately high heat. Add the veal and 1/4 teaspoon salt and cook, turning, until just done, about 1 minute in all. Remove. Reduce the heat to moderately low. Add the remaining 1 tablespoon oil and the onion. Cook, stirring occasionally, until translucent, about 5 minutes. Stir in the vermouth and then the broth and cream; bring to a simmer. Cook, stirring occasionally, until thickened, about 4 minutes. Add the peas and heat through, about 1 minute. Add the meat with any accumulated juices and the remaining 3/4 teaspoon salt. 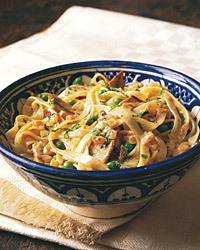 In a large pot of boiling, salted water, cook the fettucine until just done, about 12 minutes. Drain. Toss with the sauce, the pepper, the remaining 1 tablespoon butter, and the mint. Let sit for 2 to 3 minutes so that the pasta absorbs some of the sauce. Mint begins to lose flavor as soon as it's picked. Even if the bunch you're using looks fine, it may have been picked long enough ago so that the flavor is weak. Taste the sauce and, if you like, add more mint. A light and acidic Vinho Verde from Portugal or a Sauvignon Blanc from the Loire Valley in France, such as Pouilly-Fumé, will mirror the refreshing flavor of the mint.